‘Thread Veins’ is the common name given to unsightly purple/red superficial veins, under the surface of the skin. These are commonly found on the legs or face. 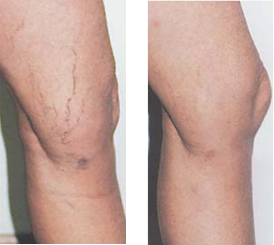 I am pleased to offer you a highly successful treatment for thread veins called Sclerotherapy. Thousands of people who have suffered from thread veins caused by broken vessels on the legs and face have been treated successfully using this method. Skills and expertise are required to carry out the delicate and precise treatment of Sclerotherapy. Treatment involves injecting a solution directly into the vein with a very fine needle. This causes the veins to shrink and makes the less visible. Each treatment will narrow the vein further until they close-down completely and disappear with a few weeks. When the solution is injected there is a slight stinging sensation, similar to an insect bite. A local anaesthetic cream could be used to lessen the discomfort. Immediately after treatment the injected area can be red, bumpy and a little swollen, similar to nettle rash. This usually settles down in a day or two. During the following few weeks after treatment, the thread veins begin to shrink down. In order for the treatment to be effective, more than one treatments session is normally required approximately 6-8 weeks apart. Sometimes 2-3 treatments are necessary to eradicate thread veins, however this does not prevent new veins developing. Is there anything I need to avoid following treatment? After treatment you will be advised to avoid bathing for 6 hours and touching or massaging the treated area. It is also advisable to avoid being exposed to extreme heat, (such as sauna’s or sunbathing), or cold for a few days. Shorts or loose-fitting garment are advisable for treatment on the legs as they will be most comfortable following your treatment. Is there anything I will be required to do following treatment? We advise that soon after treatment you should put on a pair of ladies’ medium support tights and try to keep them on continuously day and night for 3 days to enhance the result of the treatment. How many sessions will I need to clear an area? You will usually require more than 1 treatment to clear an area. This will be assessed at your consultation. It can take up to 8 weeks for the veins to shrink following your treatment. *More than 1 treatment is required to clear an area.